The Council of Ministers have voted to free up 71 million euros to build the 12,2 km stretch of high speed railway between Pulpí and Cuevas del Almanzora. This bit of the AVE was supposed to be paid for last year, but the money comes four months after expected due to “technical problems” with the plans. It’s the extension of the abandoned AVE project that runs past Los Gallardos and Turre that cost upwards of a billion euros. The government wants to show it’s doing something ahead of elections this year, and this seems the cheapest way of silencing critics. Neither one thing nor the other, I’m afraid. Here’s the route of the proposed line, if it ever gets built. 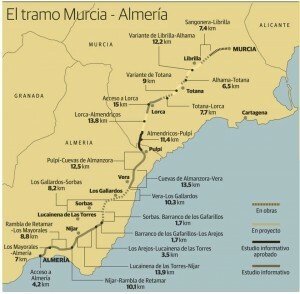 Click to see it bigger, or click here to see more information about the AVE high speed railway to Almería. 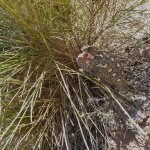 This entry was posted in Blog and tagged almeria, ave, budget, cuevas, high speed railway, pulpi by David. Bookmark the permalink.